In recent years there have been lower cost "arctic" hoses that have entered the global market so our NL3280 Arctic Multi-Purpose (presently NOT rated for bio-diesel) offers a lower cost option for use in applications not requiring ULC listing or for less frequent/demanding arctic applications where traditional hoses may be seen as cost prohibitive. 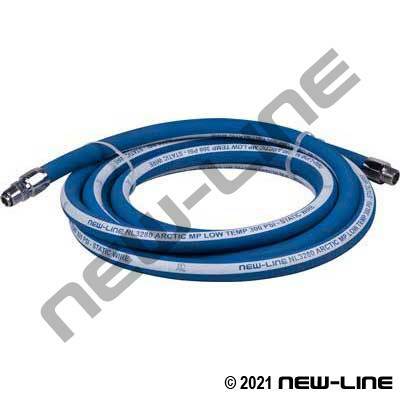 Although this NL3280 is at a lower price point, over the years we have found our Goodyear NL3109/NL3265/NL3270/NL3275 hoses have been the most widely used hoses or preferred choice amongst aggressive users, ULC fuel pump applications or those who prefer a brand name product with a proven track record. Special Note: This hose is presently NOT rated for bio-diesel use. Construction: Tube: Black, low temp synthetic rubber. Cover: Wrapped, blue low temp synthetic rubber. Reinforcement: Multiple layers of synthetic yarn and an anti-static wire.